There are 27 posts in this thread, and it has been viewed 15555 times. 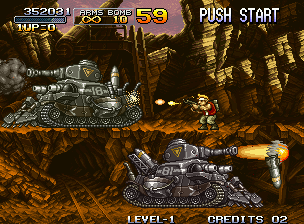 Metal Slug has also been ported to many other consoles including the PSOne, Saturn, PSP and more. 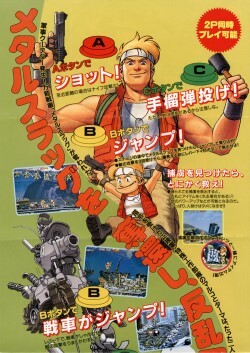 Developed by Nazca, the Metal Slug series should be a game known to everyone by now. Just in case you haven't played it, it's a run and gun game featuring some of the best animated 2D graphics in any game. Released in 1996 at a time when lots of great quality Neo Geo games came out (KOF 96 anyone? ), it still stood out and gained a big fan base... hence the numerous sequels ever since! If you are a fan of this style of game, then you need a Metal Slug game in your collection in my opinion... no questions asked.... The later games in this series add things that make the game even better and add some more variety, and also balance the bosses so that they aren't as much of a walkover as the ones here. Even so, I still highly recommend picking this game up if you want an introduction to Metal Slug! If you played one of the other Slugs first and are yet to play MS1, then I still say give it a try as it is still a VERY solid game. Either way, run and gun shoot 'em up fans can't really go wrong! My favourite Metal Slug, of the ones I've played. I feel like the zombies and sci-fi elements in 2/X and in 3, and all the extra gameplay elements and the overall art style in these games are just not to my tastes - I much prefer the back to basics and slightly more 'realistic' feel of the first game in the series. 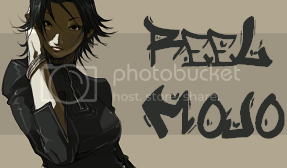 While some may say that the seqels offer more variation, I don�t fully agree. In this game series the original installment is still the best (IMO). This game is amazing. Superb graphical design, uniqe style, great fun to play. I personally think that this is the best game in the series. I don't really care much for being turned into a zombie or mummy, like in the later games. Also, I enjoy the Slug games best when playing with a character "on foot", not in a vehicle, on a camel, or flying, or swimming. Although those are good for variation to a certain degree. The first time I played this game was a demo on a Playstation Underground CD. Just thinking about how long ago that must have been amazes me as the game doesn't feel old at all. I recently played through the Metal Slug Collection on my PSP so I could talk about how, in my opinion, some of the sequels are superior games but when it comes down to it this is the game that started the series. In this game everything was new, fresh, and brilliant. One of the top reasons to love the NeoGeo. Now this is a game I can relate to: a good ol' action game! I honestly don't remember it being released for the Playstation, hmm. 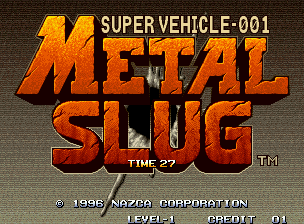 Metal Slug is way better than its sequels, I think. Interestingly, I notice MotM was featured a while back. This means that NGPC games are eligible to be featured too? Just because the sequels added more to the series, that doesn't necessarily make the sequels better, in my eyes. It is the simplicity of the original that keeps me coming back for more. 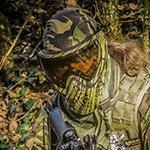 I actually like running on foot, gunning down the enemy. There's something very human about it. The original concept reveals killing for the dirty thing it is. You know, now that you mention it, I found mummification, and the camel and mech riding in MS2 quite frustrating, above anything else. And to be honest, the more I think about it, the more the later sequels were merely catering to the cult following the series has established over the years. I don't think one needs to play all the way up unto the last game to get the just of what Metal Slug is about. Didn't care for the machine gun. My fav is the flame shot! Not much else you can say really. 2, X, and 3 built on a great game. While the later sequels took away as much as they added. The original trilogy stands to be the best Run 'n Gun games ever made. Those that deny this do so out of the annoyance of memorizing enemy attack patterns, or go with Contra purely out of nostalgia. Masterpiece. There are few gaming experiences that topped this one for me. I like MS3 too, but I gotta give props for the game that started it all. One of my first neo games and one I still consider to be among the best on the neo. I think the fact that, for once, opinion is not divided on the game of the week (11 votes so far and all for "amazing game" is testament to the game's appeal on a basic, primal level. It's freaking awesome. I only have this Slug and Metal Slug 3. 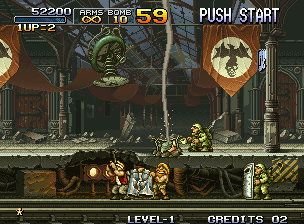 I love Metal Slug 3 - the madness of it and the slickness. I have spent much more time on that one, but there was something very refreshing coming to back to this one. Its more straightfoward and it some ways this makes it better. On Slowdown - this is unforgiveable in my opinion - why create such a great game and have slowdown in it. If they put as much effort into the programming as the graphics this wouldn't have happened. I think the Slug games are 2D bitmap artwork at their best, beautiful animation with chracter and humour, and fantastic animation. I have read some critiscm of the MS series about not being able to fire diagonally (normally), what do people think about this? I think the current system works well but I would like to see a SLug game where you can fire diagonally with all weapons, to see what they would come up with. I'm sure I read that the persident of SNK like this game so much he bought the developer. Does anyone know if this is true? I do know that Metal Slug one is a special game to lots of people, but I never liked it that much. I really like Metal Slug 2, X and 3 more than the first (I also really like part 5 and 6). I just find the first one pretty dull to play and look at...the others are more varied in graphics. So personally I think it's both overrated and overpriced. I can't think of any game that is worth what people are asking for the AES cart! Possibly inspired by the topic, I've ordered Metal Slug Anthology for the PS2 off of eBay. I've played the early games in the series but not the latter ones - was going to hold out and buy one or two for the MVS when I get it, but I got impatient, just like how I did for KOF 2003, and just picked it up nice and cheap on the PS2. 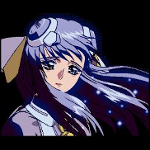 My understanding is that Nazca were a completely seperate company and after the success of the first game Snk took them over and I assume at least some of the same people worked on the second game. Someone please correct me if I'm wrong here. I've not heard anything specific about the Snk president liking the game though. 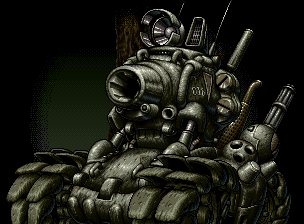 Metal Slug is quite simply a masterpiece. Visually it's a work of art. Gameplay is very addictive and couldn't really be any better. The level design is perfect. This game is my personal favourite in the series but ultimately I do think Metal Slug 3 is the best in the series. I always find if I talk to people who are really into gaming that practically no one has heard of the Neo Geo. Hardly anyone has heard of The King of Fighters or Samurai Shodown but it seems practically everyone has heard of Metal Slug so it's obviously the most famous Neo Geo game. It is indeed one of the finest platformers ever made. The locations of the missions were chosen very carefully and widespread around world: 1. Indonesia, 2. London, 3. Finland, 4. Germany, 5. Slovakia, 6. Southern Africa. The part where the last remaining soldier throws the paper plane which travels everywhere the battle has taken place is quite symbolic. I always prefer Marco to Tarma. My favourite music is the Mission 2 and the Mission 4 tracks. My favourite weapons are the Shotgun and (only found in the Final Mission) the gun cannon. Too many exciting features in this game have been scrapped from the second game, such as tank bosses, the gun cannon, jungle landscape and no convenient ending. I would have liked it at the end of Metal Slug 2, that a last remaining soldier lets go of a balloon which flies everywhere the battle has taken place. I know another game similar in genre and shooting to Metal Slug. Its a SNES game called "Super Star Wars". Regarding the GBA version of Metal Slug, It's not all that good to me.